The Collage House is a gorgeous upcycled house in Mumbai. Built for a large, multi-generation family, the house cleverly reuses old building materials. The repurposed style was inspired by India’s informal settlements. The house facade prominently features salvaged windows and doors. Collage House was designed by S+SP Architects. The design style of repurposed materials was sparked by the informal settlements in India. We love the eclectic and creative reuse of materials. Old windows and doors have been artfully arranged as the house’s facade. From the inside the windows and doors are a major style feature. Many of these windows also have functional hinges. They allow for cool breezes in the living and dining rooms. Living in Mumbai, it is impossible to ignore the informal settlements in the city. If looked at closely there are many lessons to be learnt in frugality, adaptability, multi-tasking, resourcefulness and ingenuity. 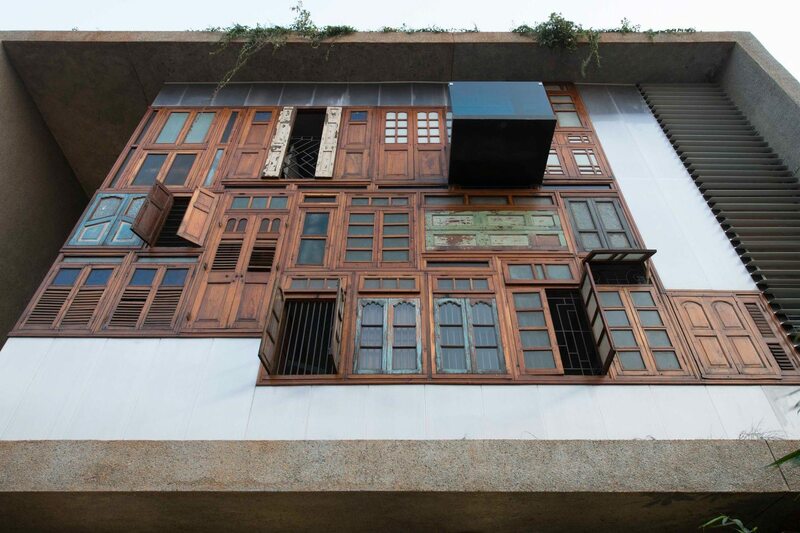 S+SP Architects were influenced by the found-materials building philosophy used in India’s informal settlements. They tried to apply these design lessons without romanticizing them. A visual language emerges that is of the found object, ad-hoc, eclectic, patched and collaged. We think that using salvaged materials for a modern house design showcases the amazing potential of upcycling for house building. Collage House is a beautiful design juxtaposition of traditional and contemporary. It is a wonderful example of the incredible results that can be achieved with reused building materials. The inner courtyard features a ‘bamboo wall’ that is made from old metal pipes. These have been fashioned to look like bamboo stalks. Spouts have been placed at the bottom of the bamboo shoots, turning the wall into a water feature during the rainy season. On the roof of the Collage House there is an enclosed pavilion topped with solar-panels. The columns are over a century old and were salvaged from a demolished house. We love the contrast of old and new shown throughout this gorgeous Collage House!